【3 in 1 Design】: It consists of mini racing drone, remote controller and compatible 5.8G 40CH FPV goggles. With these,it can bring you first-person perspective,let you experience more thrilling! 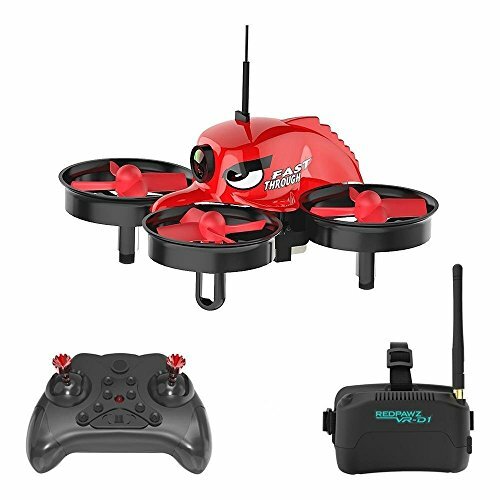 【2.4GHz 6-Axis Gyroscope】: 2.4GHz remote control technology ensures precise control.With built-in 6-Axis gyroscope, you can perceive the location changes and accurate aerial positioning. 【Functions of Racing Drone】: Headless mode/ one key return/ 360°Roll/ 3-speed option/ Up / down / left turn / right turn / forward / back / left side fly / right side fly. Suitable For Indoor And Outdoor Crossing. If you have any questions about this product by Redpawz, contact us by completing and submitting the form below. If you are looking for a specif part number, please include it with your message.